With the release of the much awaited iPhone 5, Samsung being one of Apple’s fiercest rival came out with a full page ad in New York times yesterday. Samsung gave a vicious swipe at Apple by claiming that the Samsung Galaxy SIII is way better than the fruity one’s latest offering and that it doesn’t take a genius to know that Samsung was first to release a revolutionary phone. This latest swipe on Apple’s iPhone 5 is a classic example of Direct Comparison Ads. By the name itself Direct Comparison Ads employs witty and sometime vicious tactics to undermine a competing product or service. This is also to sway the current patrons of the competing product to change their views as well as to influence the views of potential clients. Not only did these kinds of adverts spark public interest and commentary but it also helped to push both competing brands to innovate and to come up with something new and better to topple the competition. With that said, we here in YTD would like to showcase for you guys some of the most creative and outrageous Direct Comparison Ads that not only shook and entertained but influenced the world as we know it. Either you are too young or you are living under the rock for the past century if you don’t know a thing or two about the fizzy war between Coke and Pepsi. The war between the two soft-drink giants started with the Pepsi Challenge back in the 70s, where people are asked to take a sip and decide which is a better cola between Coke and Pepsi. Of course being a Pepsi Challenge, Pepsi declared themselves as the winner since people back then want their soft drinks to be sweeter. Coca-Cola on the other hand came back with a subtle if not non-direct attack to Pepsi with the launch of “Coke” which boasts that it tastes better than before but this was sadly halted since people preferred the original taste of Coca-Cola. While Pepsi seems to always make fun of Coca-Cola, Coca-Cola never really tried to attack Pepsi in a direct manner but instead the company chose to improve their products and go for the emotional approach rather than fight Pepsi in its terms. Up to now no one really knows who is the better soda maker, but one thing is for sure both Coca-Cola and Pepsi will sure quench that thirst. Things are much more interesting in the automobile world. Car companies such as BMW, Audi, Mercedes and the likes have been seen trying to out-stage each other. Whether in billboards or in magazines these car magnates produced some of the most creative and hilarious one line taunts against the competing companies. 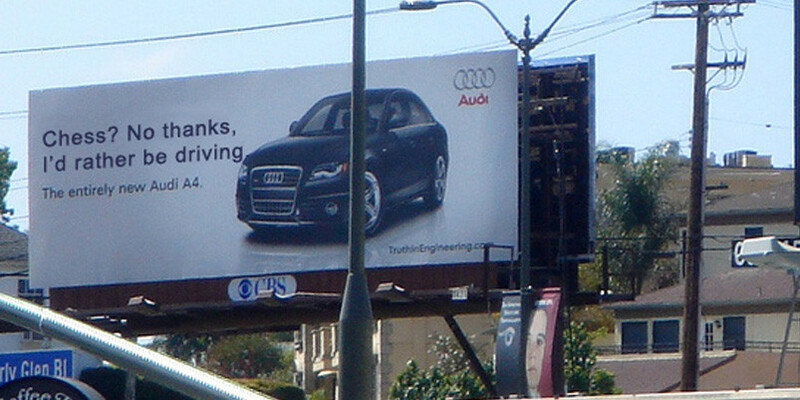 One of the most famous battles was between Audi and BMW which all started in a simple billboard in Los Angeles C.A. but as soon as Audi’s latest rebuttal came out BMW was quick to respond with something mightier than a billboard and as it turns out BMW tied a blimp to Audi’s billboard. Most think that this billboard war is one of the most exciting if not outrageous things that has ever happened in the world of advertising, while there are other people who think that both campaigns are childish but it will not deny the fact that both BMW and Audi had a significant increase in sales thanks to this interesting match of machines. Even before the world famous Get a Mac advert series came out, Mac and PC (in this case IBM) is already dishing out serious attacks on a white background on why should you chose a PC or a Mac. On the first half of the video IBM claims that it can churn information way better, while Mac attacks IBM with the premise that Mac is easy to use since you don’t have to go through binders of instruction. Fast forward to modern times when Apple produced the hit TV spot Get a Mac campaign which gave the Windows a serious run for its money. The 66 TV spots ran for four years and has been highly lauded as one of the most funny if not creative TV spot that came out. Of course Windows does not want to go down without a fight and it came out with the Laptop Hunters series. Mac and PC still continues to one-up each other but it seems that Apple’ is being targeted by several companies other than Windows to topple Apple’s current market standing. Such companies like Samsung and Google’s Android OS (vs iOS). Passionate fans of both sides continue to try and prove their supremacy over the other in forums and youtube comments. Considered as one of the classic examples of Direct Comparison Ads is the Avis vs. Hertz campaign. Going back in 1962 Hertz is the undisputed car rental service of America while Avis was slowly sinking down the mire of financial ruin since they only have 11% of the market share, and add to the fact that they hadn’t made a profit in 13 years. Bill Bernbach was given the task to create an ad that not only will save Avis but will also put it in a steadier footing. Bernbach enlisted art director Helmut Krone and writer Paula Green in the project and what they did was simple. They told everyone the truth. Avis admitted that Hertz was the no. 1 in the car rental industry but Avis say that they always try harder. Not only did Avis told the truth but it also made Hertz look complacent, indifferent and a big mean corporate giant which aid Avis to have a steadier foot hold in the industry. After the launch of the infamous “We try harder” campaign Avis’ market share increased by 35% and it got them into the minds of the consumer as a hard-working and earnest company. The Avis vs. Hertz campaign only proves that sometimes being brutally honest is enough to drive a point home and also to change people’s minds when it comes to service. No one is really the clear winner but which ever side you choose there is only one thing for sure, without this competition between brands. Humanity would be stagnant in developing newer and better products that will make our lives easier and interesting. The very same thing goes for design, as designers we should always try our very best to innovate and make interesting things whether it is a simple poster or a business card. We would like to hear your thoughts about this article so do drop a comment below and Do check us out on Facebook, Twitter and Google+ also do not forget to subscribe to get first dibs in all things graphic design.